THE spectre of superbug still hangs heavily on the residents of Delhi. To make matters worse, another study conducted in the capital has found that cholera bacteria might also be becoming resistant to drugs. Similar results were found in a study conducted at Solapur district of Maharashtra. The studies found that cholera bacteria—Vibrio cholerae—exhibited “high-level resistance” to antibiotics like nalidixic acid, furazolidone, cotrimoxazole, polymyxin B, streptomycin, sulfamethoxazole, trimethoprim and rifampicin. The researchers believe that enhanced exchange of genetic material from one bug to another in human gut or natural environment confers such resistance to the bacteria. The study in Delhi was carried out in collaboration with University College of Medical Sciences at GTB Hospital, University of Delhi and the National Institute of Cholera and Enteric Diseases. The researchers collected 1,424 stool samples from patients above five years of age and showing symptoms of cholera onset— watery diarrhoea and vomiting. The study analysed bacterial responses to eight antibiotics—chloramphenicol, cefotaxim, ciprofloxacin, cotrimoxazole, furazolidone, gentamicin, nalidixic acid and tetracycline. They found that in 98 per cent of the samples O1 strain of cholera bacteria was prominent. “This strain was 100 per cent resistant to nalidixic acid, furazolidone and cotrimoxazole,” says Shilpee Choudhry, lead researcher. In contrast, most of the O1 strain were sensitive to chloramphenicol (98.3 per cent) and cefotaxime (91.4 per cent). The O1 strain were partially resistant to gentamicin and tetracycline. The strains were earlier sensitive to the drugs. But in 2007, 41.3 per cent and 58.6 per cent developed resistance against gentamicin and tetracycline respectively, the researchers say. “Multiple drug resistance in cholera bacteria can be due to transfer of resistance genes between members of human gut bacteria and V cholerae,” Choudhry says. The study was published in the April issue of Journal of Infection in Developing Countries. The study conducted in Solapur analysed 41 cholera bug isolates collected during the disease outbreak in March 2010 there. It found that E1 strain of the bacteria having resistant gene CTXB had become resistant to chloramphenicol, tetracycline, ampicillin, sulphamethoxazole-trimethoprim and streptomycin. The researchers say these genes can easily be passed between bacteria by plasmids—independent, circular, self-replicating DNA molecules found in the microorganism. “Such transfer of genes between V cholerae and other bacteria may increase the risk of morphing cholera bacteria into a superbug,” says Gopal Nath professor at Banaras Hindu University. 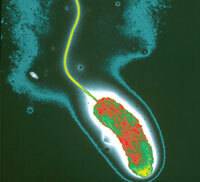 Drug-resistant genes have also been found in Escherechia coli and Klebsiella pneumonia. The resistant gene found in these bacteria is called New Delhi metallo-beta-lactamase-1 (NDM-1), a type of beta-lactamase gene. A study in the May issue of Lancet Infectious Diseases claimed to have detected NDM-1 gene on the chromosome of cholera bacteria. The study analysed 171 seepage samples and 50 water samples from Delhi. The resistant gene can easily jump from chromosomes to plasmids facilitating its spread (see ‘Superbug threat is for real’, Down To Earth, May 1-15, 2011).